Netcast Entertainment Access is the big feature differential seperating the LH50 series from other 120Hz LCD models. HQV Benchmark: Processor testing with the LH50 showed excellent results. 720p/1080i/1080p Picture Quality: A couple of differences we noticed right away with the 47LH50 was the improved anti glare screen which doesn't have such a detrimental effect on the black levels or viewing angle of the screen. Black levels remained acceptable and even somewhat saturated with HD material and the viewing angle problem is gone. There was excellent dark shadow detail when viewing the new Blu Ray release of Rocky. A stunningly clear HD shot from Netflix fed TV series Lost. Black Level: Black Level/Contrast: Though certainly not the richest and deepest we've experienced, black levels on the 47LH50 are adequate and the excellent dark shadow gray scaling helps to make up for any deficiency in this area. LG lists a dynamic (read dubiously tested) contrast ratio of 80,000:1. Our post calibration ANSI contrast measured modest but respectable 861:1. This TV has great balance and during viewing we did not sense a lack of deep blacks or of bright whites during sunlit scenes. This shot from Netflix HD fed Serenity shows off high brightness and great blacks in the same scene. Up conversion from 480i: One of the foremost lessons to learn with this TV is to turn the 120Hz/240Hz TruMotion processing off when watching any film based content. Even on the low setting will present you with unwelcome added effects in motion scenes in particular. Strange "canned" background set visual information will appear and disappear depending on whether there is motion. 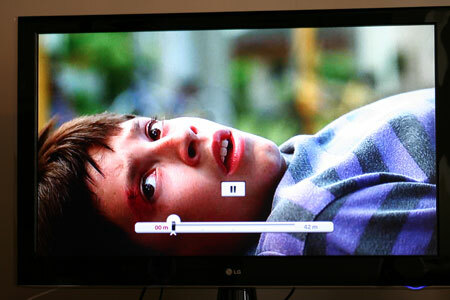 With that out of the way, on to picture quality considerations with up conversion from 480i. The TV did a remarkable job with this process and displayed a beautiful picture with natural colors, good black levels and lots of detail. Flesh tones are realistic in this shot from The Big Hit. Dark Shadow Detail: With the new LH50 series, LG has managed to provide a TV with an anti glare matte finish and still provide plenty of dark shadow detail. I was happy with shadow detail in scenes from all our input sources. The hazy appearance of some past screens was not present. Color Rendition/Color Accuracy: Rocky looks amazing on the LCD. Not too over saturated but just right. Where there is gray in a scene the TV is satisfied with letting the scene be gray. Colors that are meant to be subdued are displayed that way. Motion Lag: There is still some jerkiness present but it's slight compared to past models. With the TruMotion feature turned on there is very little motion lag so this feature is ideal to use for sports programming and games. When turning the feature off for film based content, there was slight side to side jerkiness but much improvement over past 2008 models. False Contouring/ Mapping: With film based content there is lots of false contouring present when the TruMotion feature is on. So turn it off and there is little to complain of then. The big key feature difference of the LH50 series LG with the LH50 is the LAN connection accessing the "Netcast Entertainment Access". This feature enables Netflix Instant Streaming video, Yahoo, and YouTube content without having to feed through a computer to receive it. The Ethernet ability is right there in the TV! 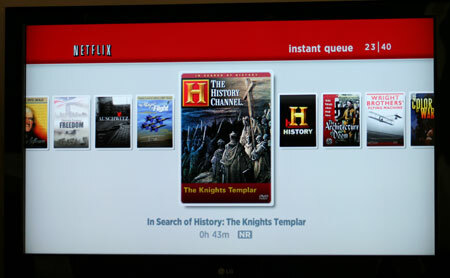 While we enjoyed watching Netflix HD content on the 47LH50, we were miffed by one very important oversight – the lack of picture menu controls for the LAN connection. Without the picture menu option, we were forced to view the incoming Netflix content with the 120Hz feature ON! Since this feature takes out the natural motion blur in film based content, we were able to see all of that annoying unintended background information which is present with the 120Hz feature. This presents film based images with a canned, kitschy appearance that varies greatly with the content. Some movies just cannot be viewed pleasurably this way. That stated, it is a very cool feature especially if your a Netflix fan – allowing for easy connectivity. The feature set up was painless. 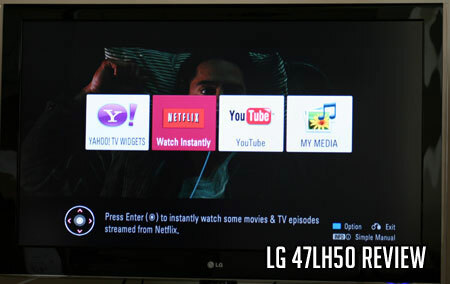 Connection to the Netflix streaming instant que provides lots of viewing options with the LG 47LH50. There is a keen Picture Wizard feature which gives some basic calibration tools to allow users to adjust the 5 basic settings depending upon ambient room light. It's an interesting and somewhat useful feature that we have not encountered. Given the attached calibrations settings from us, you will not need it except for fine tuning. The LH50 is Energy Star 3.0 rated. Video Aspect Ratio Sizing: There are several aspect ratio adjustments in the menu system. There is no discrete button for these on the remote control, which is a shame. It's such a convenient feature to include. 16:9, Just Scan, 4:3, Zoom, Cinema Zoom 1 through 16. The Cinema Zoom feature did a nice job of scaling and includes algorithmic sizing. The viewer can "zoom out" the top and bottom black bars on 16:9 content if desired (while losing some of the sides). There was some stretching evident with 2:35 DVD programming. Aesthetic Considerations: LG has improved the looks of their TV offerings considerably with the LH50 series. The bezel is gloss black with a clear glass edge around the perimeter to give the impression of depth. The frame is not too wide and the screen has a matte finish. The TV comes with a lightweight semi circle gloss black stand that conveniently swivels side to side. When the TV is turned on there is a small red light that flashes then turns blue in the bottom right section of the frame, which can help locate the power switch in a dark room. It's also just a cool little effect. The bezel is 3.4" deep providing a good depth for wall mount applications. Remote Control/Menu Functionality: The remote is simple and well designed, easy to use. The menu has graphics that make it enjoyable and easy to navigate. I do wish the the remote control had a discrete button option for tuning the TruMotion feature. This would make turning this feature off much easier. 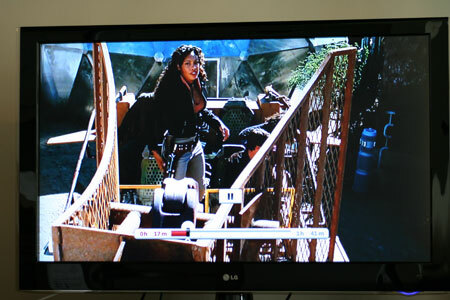 As well we like to see a discrete aspect ratio button on the remote for changing aspect ratios during DVD programming. The menu provides extremely friendly calibration white balance settings, so as a result we (and now you) can dial the set in perfectly for optimum viewing. Audio Output: 10W X 10W speakers drive the sound from the invisible speaker system. This new audio system eliminates traditional speaker drivers and contains speaker actuators around the perimeter of the entire bezel. We found the sound a little tinny and hollow. Special effects were more dynamic and voluminous than voice. Overall there was some improvement in sound from prior models but still more room for improvement here. Volume levels seem inadequate and the sound experience can be muddy. The Sony KDL-46Z5100 has an Ethernet connection port containing access to Amazon Video on Demand and other similar features such as 120Hz processing to the LG 47LH50. The Z5100 price tag is usually $100 to $200 more expensive than the LG. Samsung's LN46B650 sells for around the same price as the LG 47LH50 but does not contain an Ethernet connection. LG's 47LH50 series is basically the same TV but without the Ethernet connectivity and options that offers. This TV sells for around $100 less without that option. Add a point or two to the value rating if you plan on using the Netflix features. Review Equipment Used: Sony Blu Ray BDP-S1 High Definition DVD player, Sony DVP-S50 DVD player, Sencore Color Pro 5000, Sencore AutoCal Pro ACP6500, Sencore signal generator.